Hey friends! 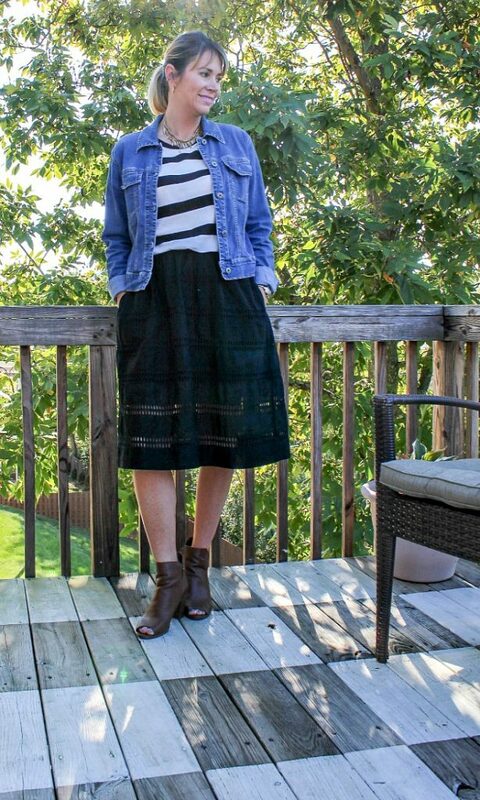 I have pretty much purchased everything that I plan on purchasing for Fall, and so far I am really happy with the new additions to my wardrobe. It seems in the past several years that I have been much more into adding classic items to my closet, and I’m more cognizant of making sure that the things I buy can be mixed and matched with a lot of things I already own, and I am really enjoying how this has been working for me when I go to choose outfits to wear. I used to just purchase what I liked and not really think about how it could work for me in my closet, and I wound up with a lot of items that I never wore. So shopping with an awareness of these things has been working out great! I also always make a list of what I want to add to my wardrobe and try to stick with it. So when I do shop, I feel like I am building a wardrobe instead of being haphazard about it. Today I thought I would share my recent outfits and go into a little detail about what is new and what is not, and ways I might mix and match particular items. If you have been reading my style posts for a while now, you probably already know this about me, but for you newbies (welcome!! ), I am a girl who likes to keep my clothes for a long time. Meaning several years, not just one or two. I also love to add vintage items to my wardrobe and love to shop at thrift stores. I consider my closet to be more of a curated closet, and I love to mix and match and try to work with what I have to come up with fresh and new looks. You will rarely ever see me wear the same exact outfit in the same exact way. Let’s start with this fringe poncho. 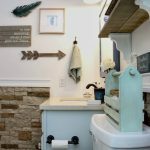 I purchased it from Glamour Farms Boutique in August while at the Haven Conference (it is no longer available, but I have linked to some others I like below). I consider this poncho a neutral item that I will wear for years to come. The fringe detail adds some flair and trendiness, but it’s not so trendy that I will need to get rid of it next season. You can see another way I styled this poncho here. The floral jeans are from Zara and are a few years old. I’ve never been the girl who changes her bag with every outfit, and although I love to look at beautiful photos of fashion bloggers with their super cute hand bags, I have to admit that is just not me. Don’t get me wrong- I admire it, but it’s just not me, and if I were to do that I feel like I would be being untrue to myself and you guys. That is why you rarely see me with a bag in photos. I usually buy one and wear it for several months, and I clean it out when there is too much trash to tolerate, HA! Last Fall and winter I bought a cute Dooney and Bourke bag at a yard sale that I carried for months, so I decided to buy myself a new bag this Fall, and it happened when I least expected it! I was at Gabriel Brothers with my son, and it just so happened that they must have just stocked their handbag section because they had so many great ones! I found this Adrienne Vittadini bag for a steal, and I love it! And believe it or not, I found the exact bag for your shopping convenience at Overstock (see below)! It has been years since I have carried a black bag, but for some reason that is the color I was drawn to that day. 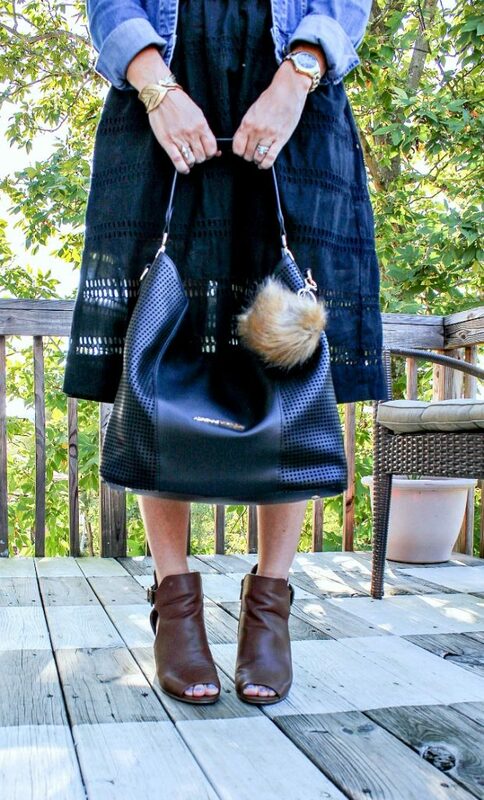 I also am loving the fur pom pom I bought to accessorize my new bag! 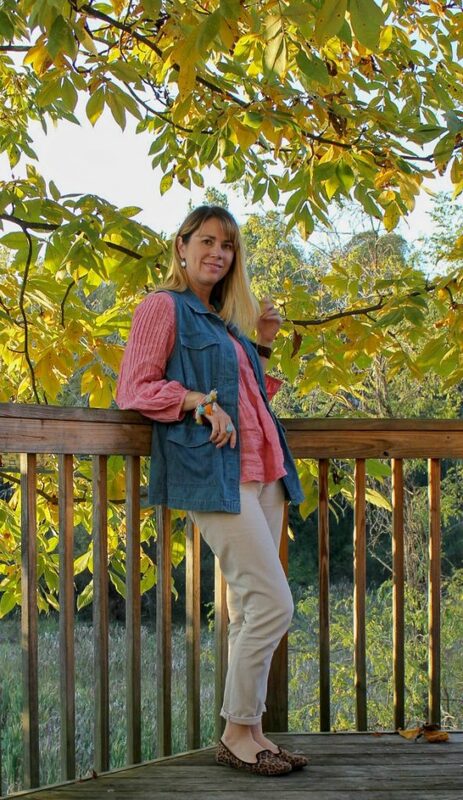 The feather bracelet you see here is a new purchase for Fall, and I love it very much! Also it is very comfy on the wrist. It is a Chloe and Isabel bracelet, called the sculpted feather hinged cuff. 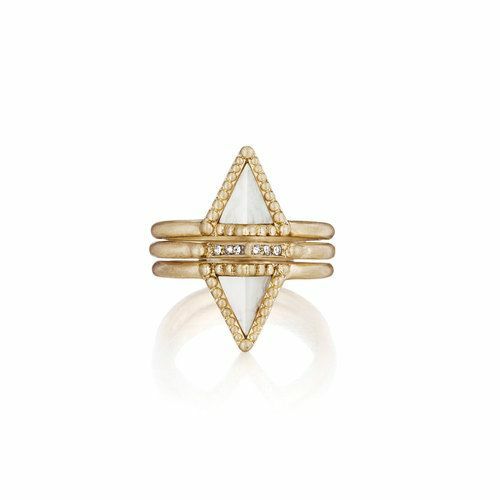 The cute ring you see on my right hand is also Chloe and Isabel and is called the portico nesting ring. 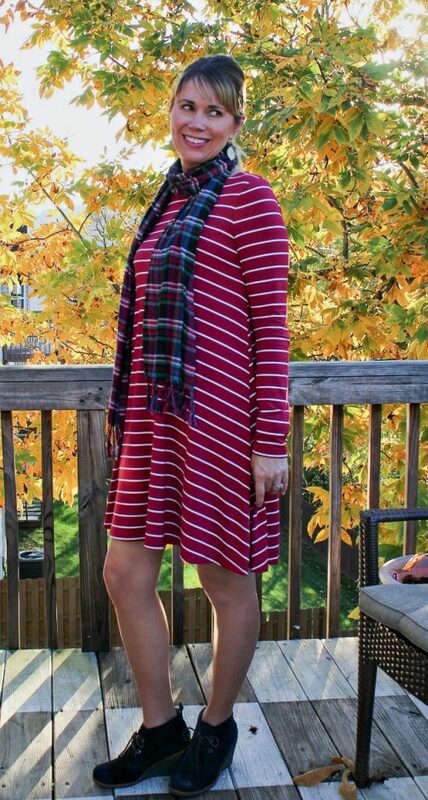 This fuchsia dress is a new purchase for Fall, and I was really attracted to the almost red color (my fave! ), and it is currently on clearance at Old Navy for $16. 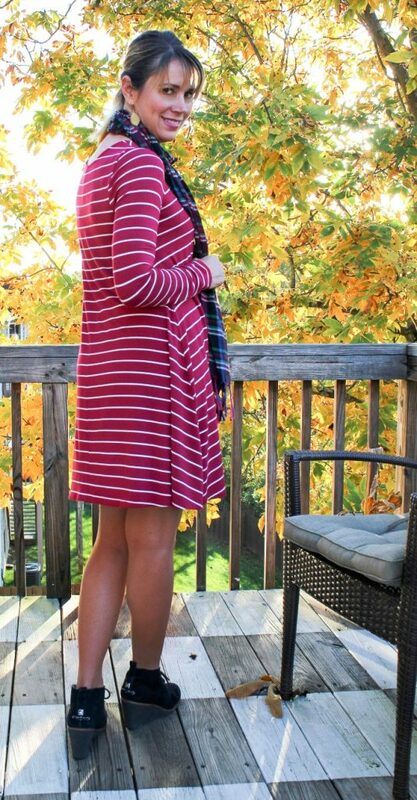 I think I will be able to style this striped dress in a lot of different ways throughout Fall and winter. This is the first time I had worn it and I mixed it with a plaid scarf in similar colors. 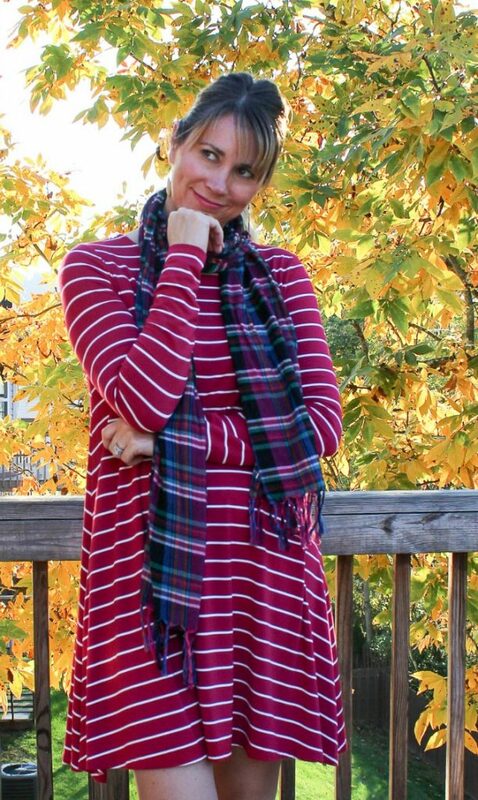 Speaking of plaid scarfs, did you check out the post I wrote last week about 50 fabulous plaid scarfs for Fall? 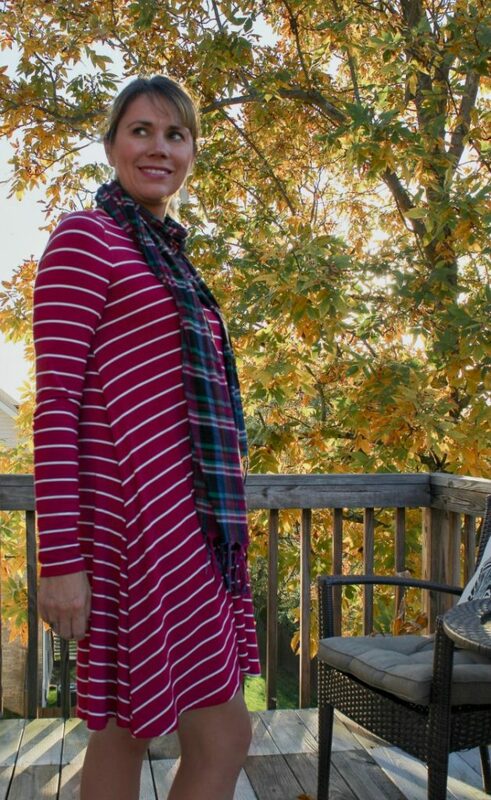 If you are in the market for a new scarf, you will love to read this post! 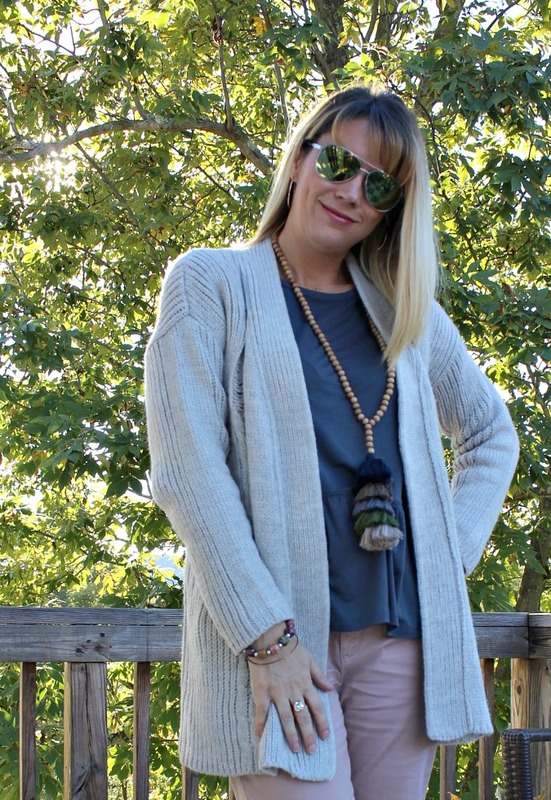 This outfit is one of my favorites of this Fall! 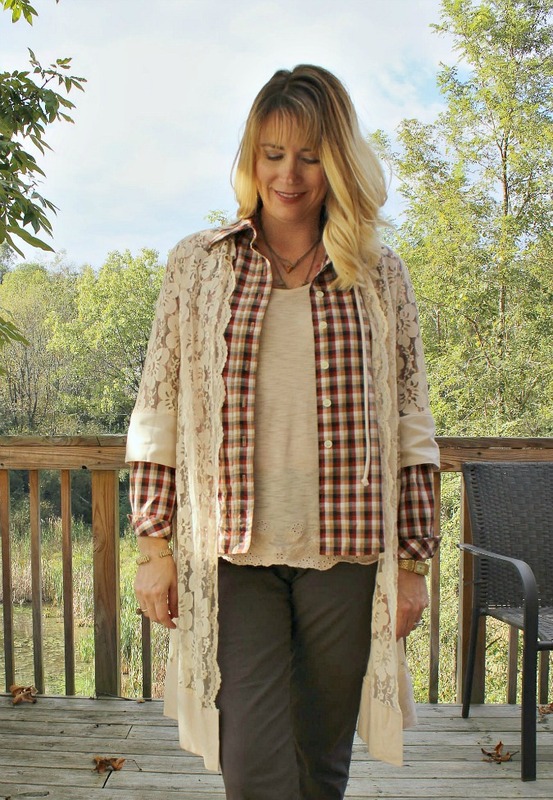 Both the lace duster and the plaid top are vintage. I found the lace duster at a vintage booth over the Summer, and I’m so glad I found it first because my cousin was eyeballing it so bad! I think I paid around $15 for it, and all I have to say is worth it! You will see this again styled in different ways for sure! The plaid top was given to me by a sweet friend who was a teacher at my school until recently (miss you Lisa!) Before she moved she brought me two bags of vintage clothing that had belonged to her mother in law. Most of it was too small, but this top is one that I kept. It is a tad too snug to button up, but I love to wear it open like this, and I am in love with the combination of the plaid and the lace! And believe it or not, I threw the lace on at the very last minute as I was walking out the door. 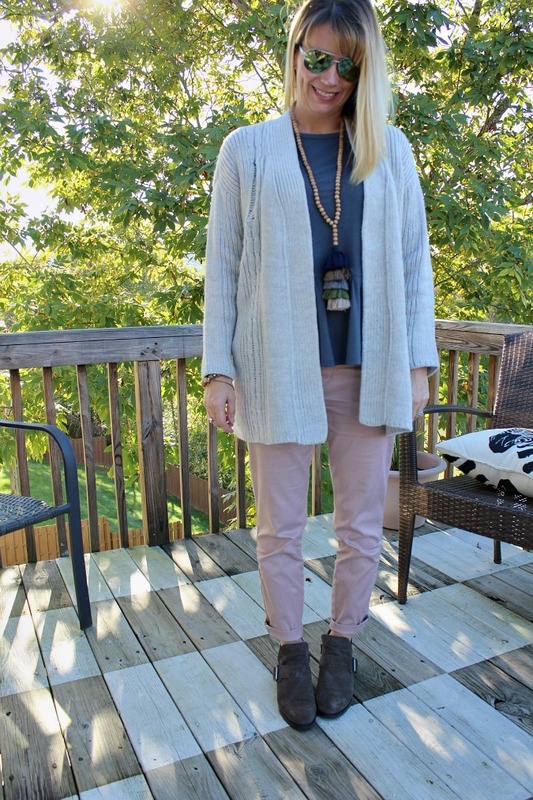 When I am layering items in my closet, I find that sometimes my favorite combinations happen on a whim like that. The brown booties you see here are a new purchase for Fall. 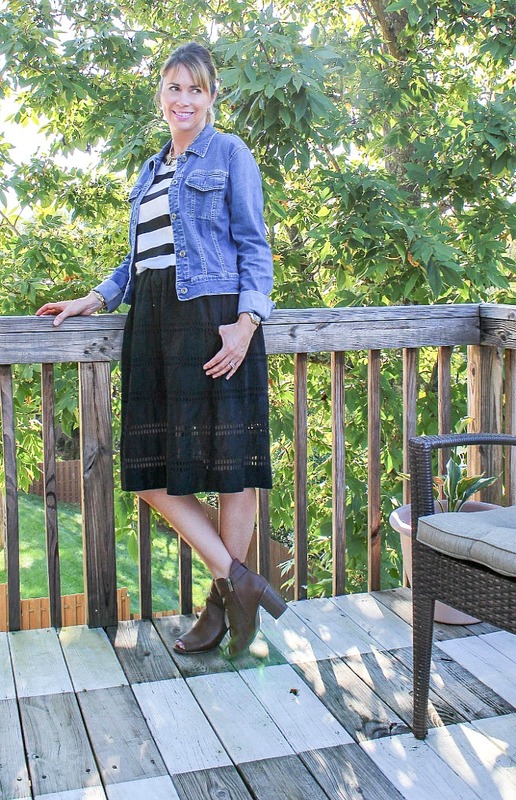 I purchased this denim dress a couple of years ago from Gap, and it was the best decision, I still love it and it is so easy to style in different ways. This time I styled it with a long cardigan, floral scarf and booties. I purchased this Olive+Oak chunky cardigan recently at Gabes, and it will be on heavy repeat this winter, it is so cozy and comfy, and I love the deconstructed look of it. 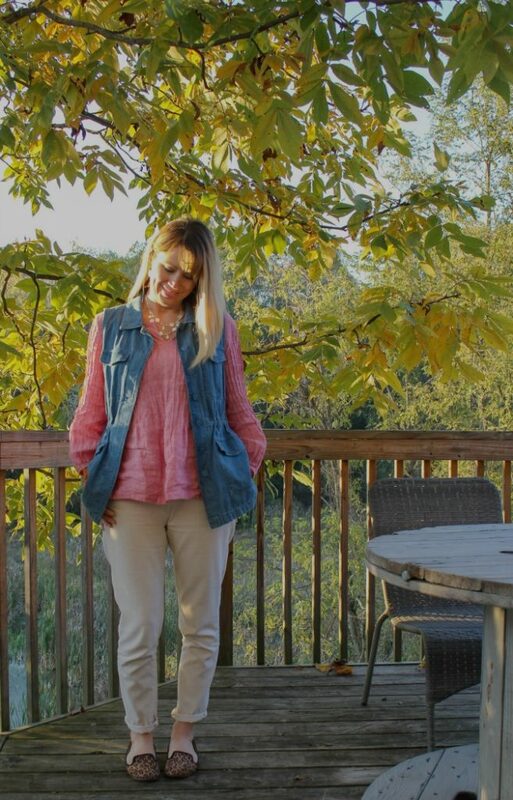 I paired it with a new gray peplum top I purchased at Old Navy for Fall and blush jeans. and let’s not forget my favorite necklace ever, this stacked tassel necklace that I want to wear every single day! i swear it just makes every outfit look instantly chic! 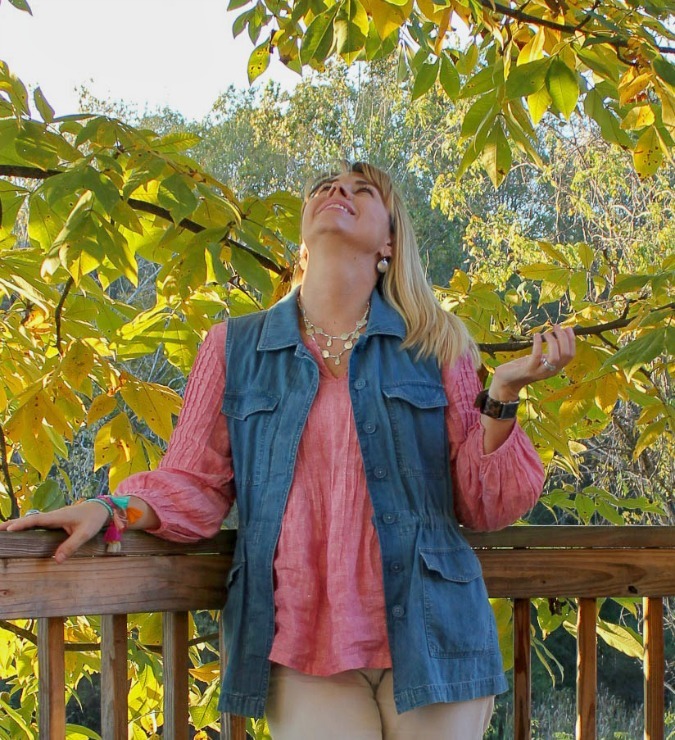 I scored this pink linen top at a thrift store, and I just love the color of it. 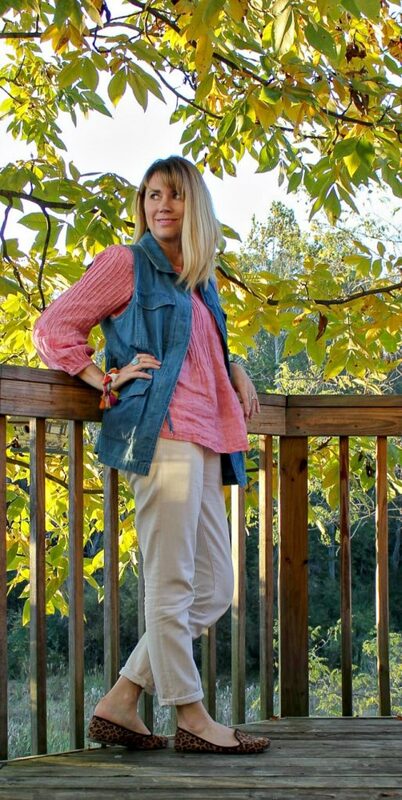 And this denim vest that I bought at the Loft Outlet in the Spring is something I so glad I added to my wardrobe. I find myself reaching for it a lot! Thanks so much for stopping by on this fine Friday and visiting me for awhile. I hope you found something here today that inspired you! Have a fabulous weekend!